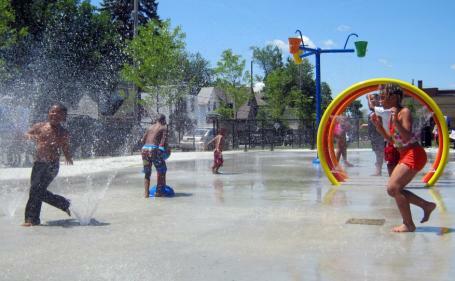 Dozens of kids enjoyed the grand opening of the park in Grand Rapids’ Baxter neighborhood. The two acre park is a step towards the city’s goal to have every Grand Rapids resident live within Â¼ mile of some kind of greenspace. That goal has been difficult to achieve since nearly all of the city’s land has already been developed. Plus, city government has been cutting down on spendingfor years. 13-year old Ashley Jones remembers the old vacant lot where the park is now. She refered to it as a âhot mess’ before the renovations. Not anymore. Two dozen kids zip through a water tunnel, giggle waiting for the next water spout to pop out of the ground, or the bucket of cool water to splash on their heads. 14-year old Aisha Childrey lives just a few blocks away. Water from the splash park will be re-used in the park’s landscape irrigation system. Steve Faber directs the non-profit group Friends of Grand Rapids Parks. The city teamed up with private donors to create and maintain the new park.